List the reasons you want or need to change your will. Common reasons for changing a will include getting married or divorced, the birth or death of a child, the acquisition or disposal of large assets like a house, and the wish to change the persons who will receive your property when you die, according to FindLaw. Knowing what changes need to be made will help you decide how to go about changing your will. Choose whether to change your will using a codicil or by writing a new will. A codicil is an amendment to your current will. Codicils are usually used for small changes like adding or deleting an asset or a beneficiary, according to FindLaw. Like the will itself, your codicil must be signed and witnessed by at least two witnesses in most states. Some states allow handwritten codicils to be attached to holographic wills -- wills written entirely by hand -- according to FindLaw. You may wish to rewrite your will, on the other hand, if you plan to change large portions of your will, such as when you have children and need to add them and name a guardian, according to FindLaw. Write your codicil or new will. You can write these yourself or have an attorney write them for you. 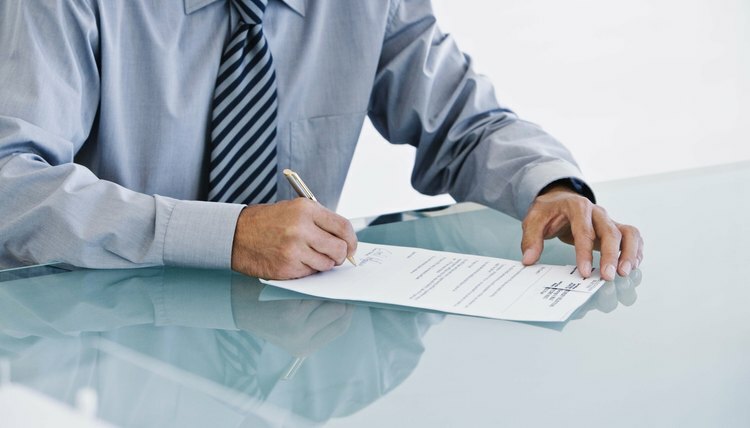 If you choose to write a new will, include a statement in your new will that says it is your last will and testament and that it revokes all previous wills and codicils you have made, according to the American Bar Association. This statement will help prevent confusion over which will you intended to have effect. Consult an attorney. Although an attorney's assistance is not required when making a codicil or a new will, an attorney can help ensure the codicil or new will is valid by ensuring it follows the rules in your state for making and executing wills, according to the American Bar Association. Check with your attorney once a year to ensure your will covers all your assets and that it is still valid under your state's laws. Gather up all previous codicils and wills and destroy them once the new codicil or will is finished, signed and witnessed.